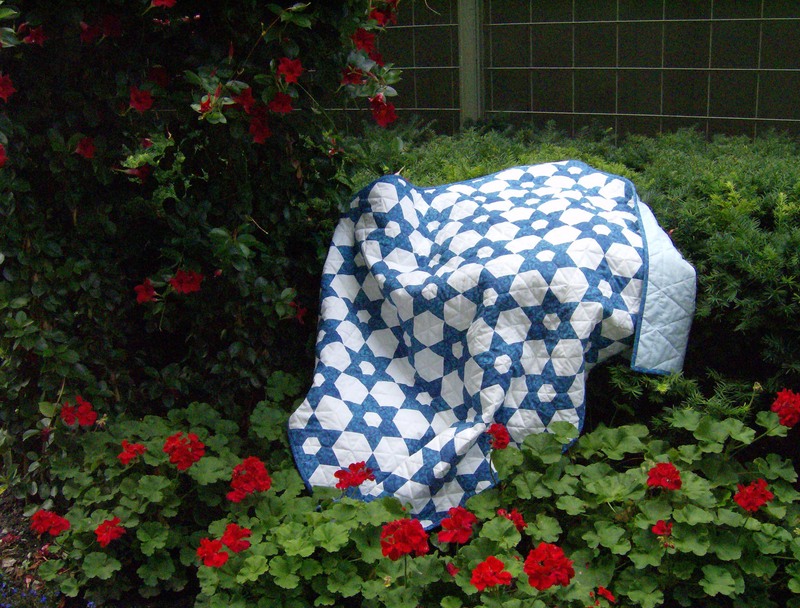 After making the mini sunflower quilt for the blog hop, I was reminded just how much I love making the 6″ sunflowers. 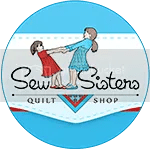 After all, they have two of my favourite things – continuous stitching and curved piecing. 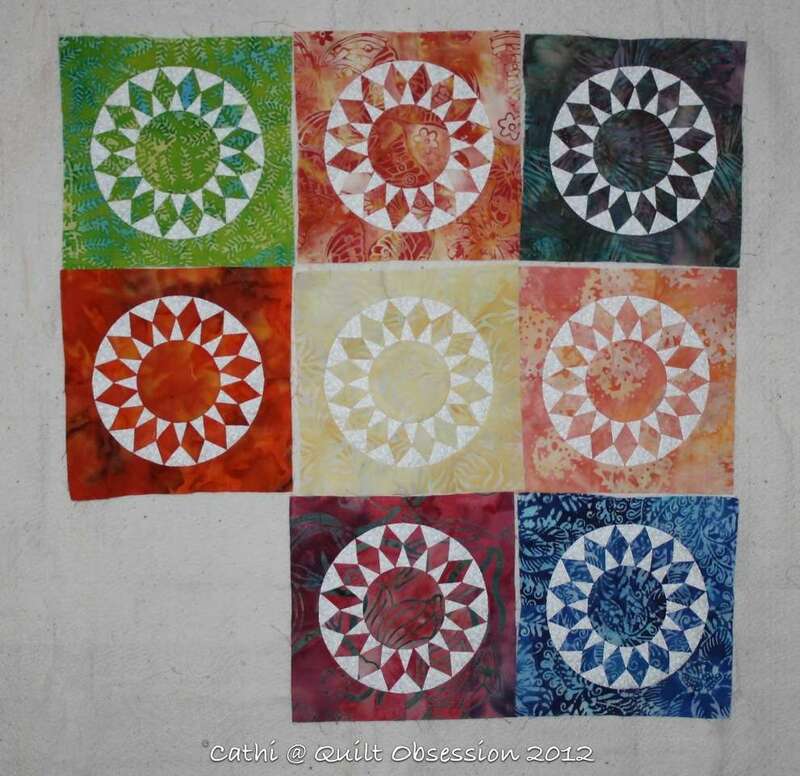 So yesterday I picked a variety of batiks for the batik sunflowers quilt and put my printer to work. Within less than an hour I had everything printed for over 50 more sunflowers. I think if you click on the photo to enlarge it, you can see the lines that were printed on the fabrics. Two small pieces of each batik are all I need for each block. Along with the two sizes of white triangles in each block. Mr. Q.O. did something to this photo to enhance the appearance of it. I printed the triangles with one of the lightest of the blues. If I had printed with anything near as dark as appears in this photo, it would have shadowed through to the front. And now I will be using that little finger-guided rotary cutter for the curved cutting and will be filling up the batik sunflower project box. I’d like to make this a colourwash quilt of sorts. As I pick up more batiks, I will add them to the mix and you’ll be seeing a lot of batik sunflowers on the blog for a while. It generally takes me two evenings to stitch a sunflower, so this won’t be a quick finish by any stretch. If it takes me a year or more, I’m fine with that as I want to keep adding batiks to the mix. And of course we all know I will get distracted by and work on other projects along the way, but the batik sunflowers quilt is definitely going to get a lot of attention. The project box is just waiting to be filled up with the pieces for each sunflower. A pair of cardinals have nested somewhere out on the roof garden. The male has been seen every day, sitting almost directly in front of our living room window. And on the weekend I was lucky enough to get this shot. I had to use the zoom on the camera, so it’s not the clearest of shots. They are such beautiful birds. “Printer’s Devil.” I have no idea why Mr. Q.O. named this ‘toon that, but he is the cartoonist so has the right to name the ‘toons however he wishes. Edited to add, thanks to Jennifer’s comment – a printer’s devil is an apprentice in a printing establishment. It is a very fitting title, as Baxter is clearly in a printing establishment when I start printing Inklingo shapes! Baxter was guarding – dozing beside his toy basket. It’s hard work getting toys out of that basket! What yummy batiks, looking forward to seeing them made up! Cardinals are so pretty, we have been lucky enough to see them on our last two trips to Canada. A printer’s devil is the apprentice in a printing establishment, it’s a very old title……so Mr Q.O. was right. Don’t let those toys get away, Baxter! I am coming back as a cat!!! on to something new again, you finish so many. 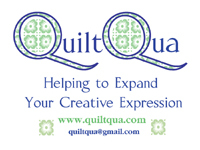 What size are most of your quilts. I never tire of Batik fabric. Keep them coming, a color wash effect is also a favorite of mine. Thanks to Jennifer for explaining the source of “printer’s devil”, that Baxter is your apprentice as you do have an “Inklingo” printing establishment. I love the colors you’ve chosen. It will be fun to follow your progress. Am not sure my skills are up to such a project. That cardinal surrounded by such green foliage is beautiful. Love those sunflowers, Cath! Can’t wait to see the effect you will have. Fabulous! Such pretty fabrics! Your sunflowers will be gorgeous!